The exact origins of Lincoln’s Inn, and in fact any of the other three Inns of Court, are not fully known. We do know that the Inn’s formal records, or governing minutes known as the ‘Black Books’, go back continuously to 1422, which is nearly eighty years earlier than any other Inn. However, it is clear that the Inn had already been in existence for some time before these records begin. It has been said that the Inns of Court and their associated Inns of Chancery emerged sometime towards the end of the thirteenth century, or early fourteenth century. By an ordinance of 1292, Edward I took the King’s Courts out of the hands of the clergy and placed them under the control of the judges. As a direct result of this, professionally trained lawyers began to emerge. Aspiring lawyers headed to London to listen and learn from established practitioners. Over time what became known as the Inns of Court and the Inns of Chancery developed. These Inns were not inns in the traditional sense, but instead were large houses used as hostels for students or apprentices. At one time, there were at least twenty such inns associated with lawyers and legal education but today it is only the four Inns of Court that survive. You can still see traces of the legacy of former Inns of Chancery particularly in nearby street names but also in the survival of Staple Inn along Holborn. The origins of the Inns of Chancery are as obscure as those of the Inns of Court. It appears that by 1540 there were nine in existence, and their role as law colleges led them to essentially become preparatory schools for the Inns of Court. Up until the eighteenth century each Inn of Court had at least two Inns of Chancery associated with them. In the case of Lincoln’s Inn these were Furnival’s Inn and Thavie’s Inn. There are two theories as to the origins of the name ‘Lincoln’s Inn.’ The first is that the name came from Henry de Lacy, third Earl of Lincoln, who died in 1311. He owned property in the area and may have been a patron of the Inn. However, it is also possible that the name originates from Thomas de Lincoln, one of the serjeants at law during the fourteenth century, who may have founded a small Inn at Castle Yard, a road that no longer exists somewhere to the East of Chancery Lane. The Inn has not always been located on this site, although it was certainly located on the present site by 1422. The Inn did not originally own the land it occupied. The main part of the Inn was held on a tenancy from the Bishops of Chichester who had been granted the land in 1228. 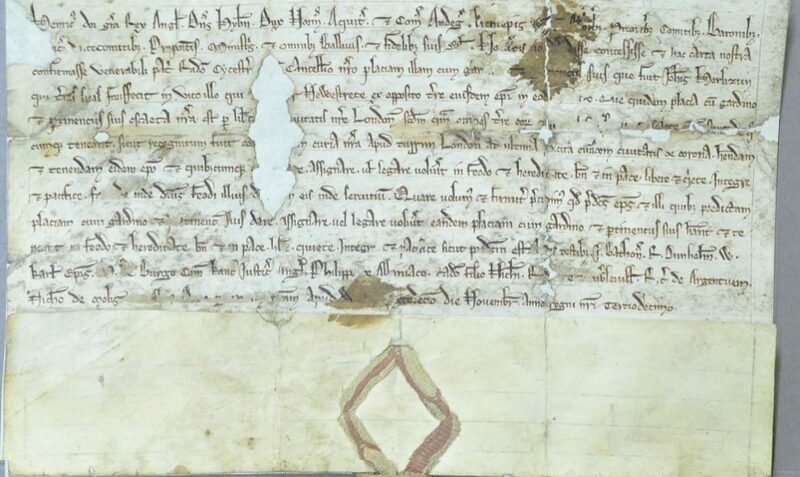 In fact the oldest document in the Archive, dated 16 November 1228, is the grant from Henry III to Ralph de Neville, Bishop of Chichester. The adjacent land to the north and west belonged to the Hospital of Burton Lazars. The benchers acquired the freehold of the whole site in 1580. 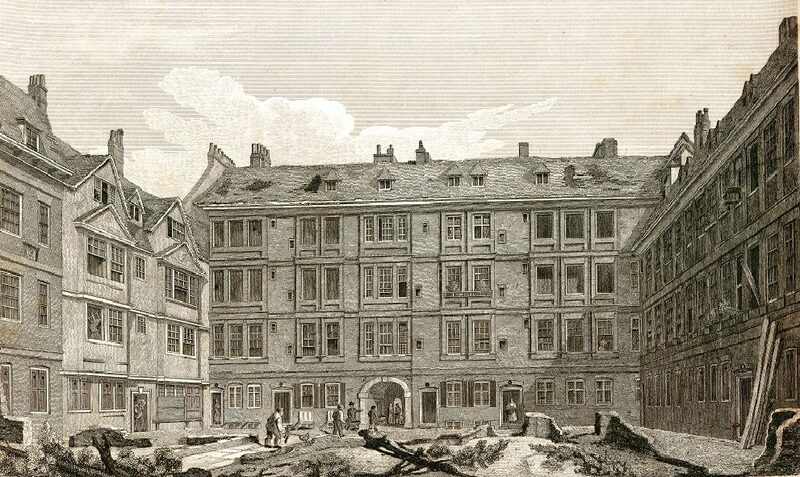 At that time the buildings comprised the Old Hall, the cluster chambers around it, and a Chapel (replaced soon afterwards, with the main entrance being from Chancery Lane via the Old Gatehouse. The development of the remainder of the site continued as and when finances permitted and opportunities arose, through to the twenty-first century. Coupled with the fact that the Inn did not lose any buildings in the two world wars, this has resulted in a picturesque variety of styles and periods. The use of the purple lion was derived from the coat of arms of the Earls of Lincoln. More unusual, are the symbols next to it. These are mill rinds – the iron fixings for the millstones in a corn mill. 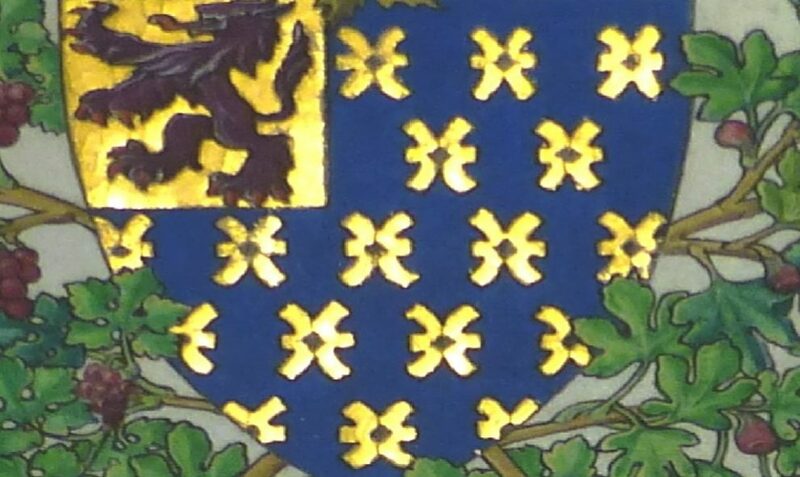 These are derived from the arms of Richard Kingsmill, who was a bencher of the Inn and who played a leading part in acquiring part of the land the Inn is on during the late sixteenth century.